Mt Bachelor in Oregon might remind your kids of a big snow cone. Bachelor is even cooler when you consider its a volcano, dormant and ski-able. Bachelor’s high elevation conical peak at 9,065′ is all above tree line, its extraordinarily scenic and offers some exciting ski terrain. Bachelor is the Pacific Northwest’s largest ski area with 4,318 acres of terrain from family friendly groomed trails and parks to untracked untamed summit snowfields and bowls. Mt Bachelor has 11 lifts, 8 are speedy quads serving a vertical drop of 3,365.’ In the snowy Cascade Mountains, Bachelor typically gets up to 400 inches of snowfall and has a super long ski season – from November until late Spring, think Memorial Day. Bachelor is a pristine skiers mountain within the Deschutes National Forest, so there is no on mountain lodging – condos or hotels, only a few day lodges like the mid mountain Pine Martin Lodge perfectly positioned for scenic ski in ski out lunch. Bachelor does boast all the family ski resort necessities – ski and snowboard school, rentals and ski shops , with convenient parking to the lifts at two base areas- West Village and Sunrise. Mount Bachelor’s panoramic summit offers some steep untamed terrain, while the lower mountain offers plenty for intermediate skiers, all well groomed. With seven express quads averaging 2,000 vertical each, a strong family of skiers could bag 30,000 vertical in a day. Even when the summit is closed, as much as 50% of the time, due to fog, wind or snow, there are five lower mountain sections each with their own characteristic trail system. From East to West, the Sunrise Express is perfect for beginners and intermediates given its protected sunny pocket with ego soothing trails like aptly named Marshmallow, and the Sunrise Lodge at the base. The Skyliner Express services a handful of pleasant blue squares. To Pine Marten Express launches you from the 5,700-foot base to the mid-mountain area where you can reach all the terrain and lifts. 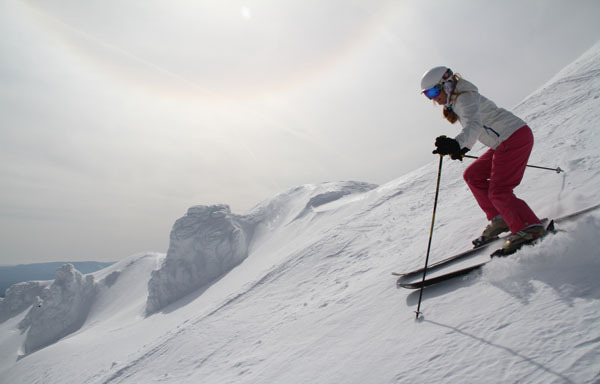 The Outback and Northwest areas have their own high-speed quads and fun undulating trails and spacious tree skiing between – with Outback more upper intermediate and Northwest mostly black diamond trails. Bachelor doesn’t get super busy, given its location three hours from Portland Oregon. A Mt Bachelor family ski vacation is ideal staying at Sunriver Resort, a planned residential resort development just 20-miles away from the ski area, or by lodging in the fun, friendly town of Bend 22-miles down the easy Cascade Lakes Highway access road. We highly recommend the posh Oxford Hotel in the heart of Bend, near the best restaurants, shopping and brewpubs. Close to Bend on your drive from Bachelor are a few more lodging options, Seventh Mountain Resort – a Wyndham resort, Mt Bachelor Village and Tetherow Lodge. Oregon family activities for après ski or a day off Bachelor’s slopes include dog sledding, cross country skiing, snowmobiling with Central Oregon Adventures just three miles from the mountain, touring the High Desert Museum in Bend, or visiting Tumalo Falls 100′ waterfall just 11 miles from Bend. Bachelor Ski Resort is owned by Powdr Corp who also owns Boreal, Las Vegas and Killington and Pico. Bachelor has an exciting 10 Master Plan approved by the US Forest Service in 2016, including a new Eastside quad lift with new trails extending below the current catch line cat track, replacement of the Rainbow and Sunrise lifts, a larger Sunrise Lodge and improved Children’s Center, and Zip Line.